1)What is Clostridium botulinum commonly used for today? 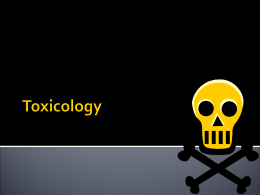 4)What were the common poisons during the European Renaissance? 5)What was the importance of Mathieu Orfila’s 1814 book “Traite des poisons”? 6)Explain how the Marsh test was used in the 1840 trial of Marie Lafarge. 9)How does synergism affect a substance? 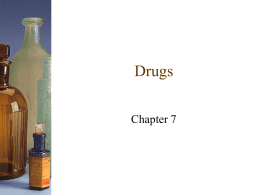 10)How does antagonism affect a substance? 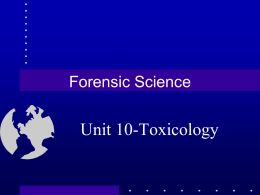 12)Why is estimating lethal doses in humans very difficult? 13)What is the lethal dose of nicotine in humans? Dogs? 14)In Dec. 2004, how was Viktor Yushchenko (Ukranian Presidential candidate) poisoned? 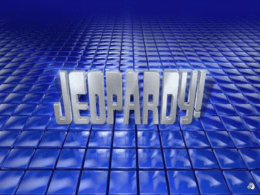 15)What is the LD50 in humans for Clostridium botulinum? 16)Explain how Aleksandr Litvinenko was poisoned KGB operatives. 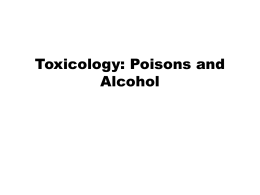 17)What are some of the influences on the effect of poisons and toxins on the body? 18)Why does arsenic accumulate in hair and fingernails? is there such a difference? 3. Lead-based paints taste sweet. How can you determine whether there is lead in paint? What are three other sources of lead in the everyday environment? Describe how Georgi Markov was killed? What did his autopsy reveal? have one or more radioactive isotopes. List three common ones. 6) Would Litvinenko have died if he had merely spilled tea laced with Po-210 on his shirt? of alcohol in breath is proportional to that in the blood. 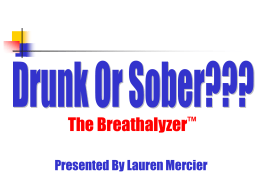 at 45 degrees indicates 0.10 BAC. arterial blood is higher than in venous blood. 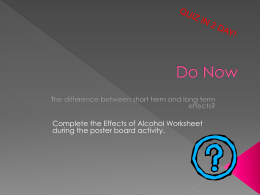 2)What is the rate of absorption of alcohol dependent upon? 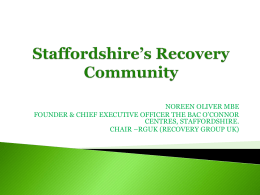 3)What is the BAC limit for alcohol? 4)How much alcohol is metabolized in the liver? 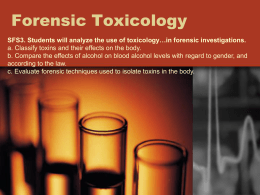 5)What is alcohol’s average rate of removal from the body? 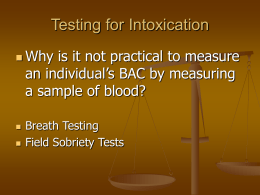 6)How do you calculate BAC for a male? Female? 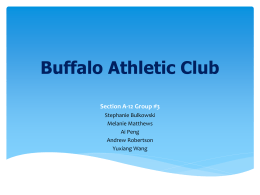 9)What is the distribution of alcohol between blood and air expelled deeply from the lungs? 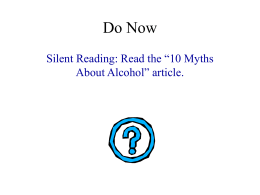 10)What does the Nystagmus test show for an intoxicated person? 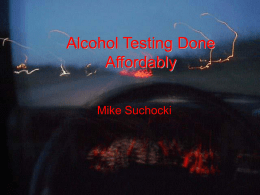 11)About how much total alcohol would you expect to find in the blood of a 110-lb woman with a BAC of 0.04? 12)Calculate how much blood the woman above has in her body. Show your work. friend without having another drink, what will her BAC be when she gets back to work? many beers did he actually have?